After The Trump-Kim Summit, U.S. And North Korea Appear As Far Apart As Ever The U.S. and North Korean accounts of the summit show two sides that seem as far apart as ever. In fact, the accounts seem to be about different meetings, writes nonproliferation expert Jeffrey Lewis. 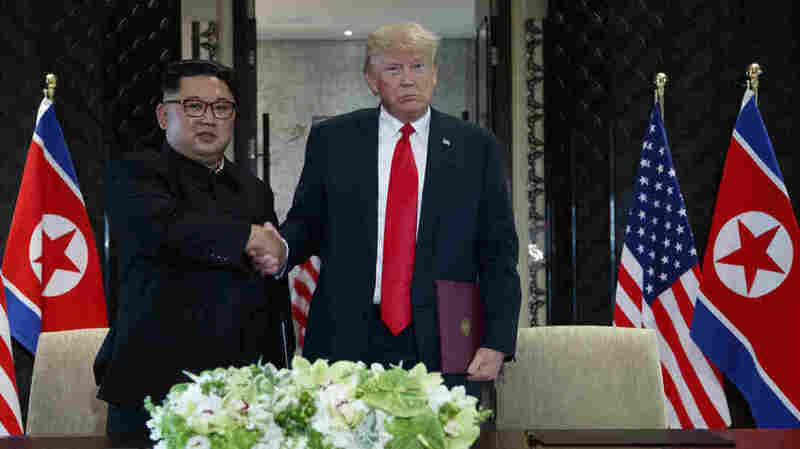 President Trump and North Korean leader Kim Jong Un shake hands during their signing ceremony in Singapore on Tuesday. Dr. Jeffrey Lewis (@ArmsControlWonk) is a scholar at the Middlebury Institute of International Studies at Monterey and author of a novel about how a nuclear war with North Korea might begin, The 2020 Commission Report. It is now clear that there is no deal with North Korea — at least not yet. Whatever agreement exists lives only in the imaginations of President Trump and Secretary of State Mike Pompeo. This is a problem. 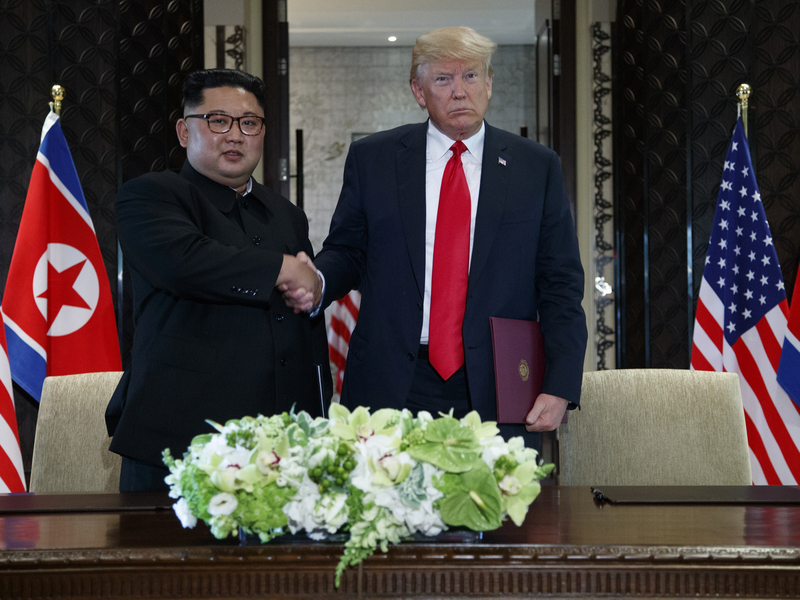 Yes, there was a piece of paper that Trump and North Korean leader Kim Jong Un signed in Singapore, a roughly 400-word statement, just long enough to run onto a second page. For something that purports to record an "epochal event of great significance," it says remarkably little. On the subject of North Korea's nuclear weapons, Kim Jong Un simply "reaffirmed" a previous commitment made earlier in the year, pledging to work toward the denuclearization of the peninsula. In contrast to this skimpy document, U.S. and North Korean officials have provided much longer, more detailed interpretations of the meeting. President Trump gave a press conference, as well as a long, rambling interview with ABC's George Stephanopoulos. A testy Pompeo also took questions from reporters. And, of course, North Korea's state media released its own summary. But the U.S. and North Korean accounts tell a different story from that offered at the summit — of two sides that appear as far apart as ever. In fact, the official readouts seem to be about different meetings. The most fundamental difference appears to relate to the basic premise of the deal: Does North Korea give up nuclear weapons first, in exchange for a better relationship? Or is this a process that will play out step by step? The Trump administration had previously ruled out a step-by-step approach. In May, Pompeo told reporters, "We are not going to do this in small increments, where the world is essentially coerced into relieving economic pressure." President Trump seemed to agree, saying Tuesday that Kim would begin "de-nuking" North Korea "very quickly." The problem is that the North Korean account said the opposite — that Trump had agreed to a "step-by-step" process in which the United States would "offer security guarantees to the DPRK and lift sanctions against it..."
When reporters tried to ask Pompeo about discrepancies, such as the lack of any reference to verification, he turned churlish, refusing to answer questions about specifics and calling the questions "insulting." When directly asked about the obvious difference between the U.S. and North Korean readouts on phasing — "Was the North['s] account of the meeting accurate when they said that President Trump had agreed to a phased approach?" — Pompeo responded with a statement that should be a huge red flag: "I'm going to leave the content of our discussions as between the two parties, but one should heavily discount some things that are written in other places." The problem is that one cannot "heavily discount" how one of the two parties interprets an agreement. Pompeo himself admitted that the two parties "couldn't reduce... to writing" the "understandings" he nonetheless remains confident had been reached. But if we know one thing about negotiations in general, and negotiations with North Korea, it is this: If you can't write it down, you don't have a deal. The two parties share an interest in continuing the process of negotiations — Kim Jong Un views summit diplomacy as a major propaganda coup that shows him on an equal footing with the president of the United States, who stated Tuesday he would "absolutely" invite Kim to the White House. For his part, Trump has found that positive news coverage of the summit a welcome change from the otherwise brutal news cycle covering his treatment of immigrant children, attempts to cover up his alleged marital infidelities and the Mueller investigation into his campaign's relationship with Russia. But it is there that the interests of the two men diverge. For Kim Jong Un, it is his nuclear weapons that brought Trump to the table. He is happy to talk and suspend some tests, but seems prepared to draw the line at actually abandoning the programs that brought him to this point. For Kim, talk of disarmament is the tribute that vice pays to virtue — no different than President Obama's commitment to seek a world without nuclear weapons, an aspiration expressed even as Obama committed to modernizing U.S. nuclear forces as long as nuclear weapons did exist. Trump, on the other hand, has promised loudly and repeatedly that this process will end with North Korea's disarmament. He has made it clear that Kim Jong Un must give up his nuclear weapons. In this way, the dispute about whether to proceed all at once or in a gradual process is really a dispute about the ultimate goal: Is North Korea's disarmament an aspiration, one that Kim Jong Un may leave unfilled? Or is it something that must happen now — or at least no later than the end of Donald Trump's first term? On this issue, the parties appear as far apart as ever.